Colorful Family | Flickr - Photo Sharing! algarvenicky, @lexandra, and 243 other people added this photo to their favorites. Hi David... it's camera movement, I panned with the subject as they went by. While I do, of course, use Photoshop or Paintshop to optimize my images, I NEVER alter the content of my images or create movement/motion effects with Photoshop. The panning is just perfect. The choice of the subject : 4 people on a bike is great too. Not a suprised i saw this photo in the 5000 views pool. looking for panning shots on Flickr, I found this one: really really well done! wow, i love it. definitely well captured!! Hi, I'm an admin for a group called The Wanderlust (Vote - World's Greatest & Ancient Architure), and we'd love to have this added to the group! Have You Seen Our Recent Competition? "Locomotive in Motion" - Contest! I'm an admin for Elite Images. We'd love to have this added to our group! Hi, I'm an admin for a group called Fotografi senza frontiere, and we'd love to have this added to the group! Hi, I'm an admin for a group called Bonjour Vietnam-Post 1 Award 3-Result Contest Sea and Islands, and we'd love to have this added to the group! 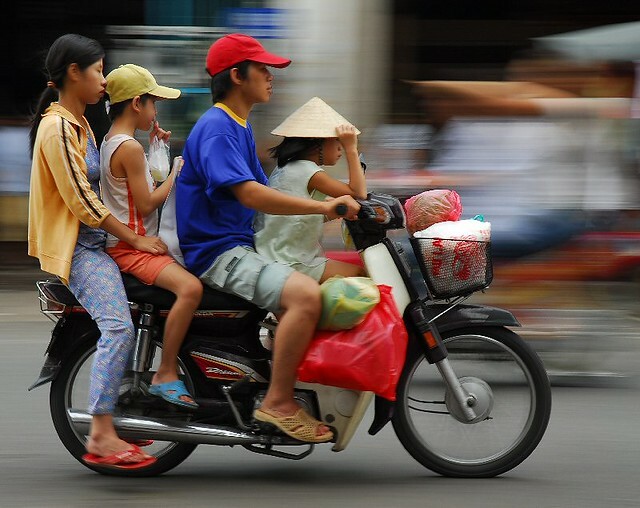 Excellent photo, seen in Bonjour Vietnam Group. Welcome to Vietnam – What a wonderful world! Hi, I'm an admin for a group called Jalalspages Transportation Album, and we'd love to have this added to the group! I love the panning photos you take. This is so much Vietnam! Parabéns pela qualidade de seu trabalho. This is amazing. Wish I could do this too some day.